I’ve written before on how to use learning loops to accelerate organic change from within. I would be remiss if I didn’t also talk about the techniques to manage broad organizational change successfully. What techniques can leaders use to manage the change management process successfully? How do you engage an entire organization in effectively moving from one way of thinking about the business to another? How do you drive strategy from the top of the organization so that it is supported and implemented throughout? How do you optimize the change process? What are the steps of a successful change management process? 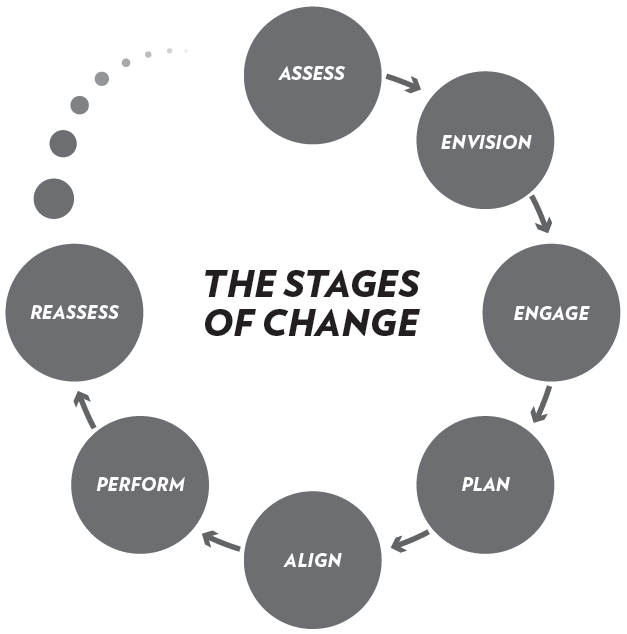 There are seven stages to a successful change management process, as the following figure illustrates. Let’s take a closer look at each stage. The first step in any change process is to agree on a set of reasons why the status quo is unacceptable. As you articulate why the status quo is unacceptable, translate those findings into rationales for change. For example, if your declining market share is unacceptable, then the rationale for change is to regain a dominant market position. Company leaders need to fully endorse this rationale. 2. Envision the desirable future. The next step is to envision the future you want. Your vision should be a win-win, both for your customers and for the company’s performance. If an organization-wide change is envisioned, this vision must come from the CEO and senior management. 3. Engage people in change. The third step is to engage managers and staff in planning how to implement. The planning process should start with key managers. It may need to cascade all the way down to the front lines. 4. Put the plan in writing. The fourth step is to develop a written plan, documenting the strategies and action steps that are needed for implementing the desired change. This document needs to be broadly endorsed and championed by the company’s leadership. 5. Align people around the plan. Once senior leaders have approved the plan, make sure everyone understands the specific strategies for change. Communicate up, down, and across the organization. Managers play a critical role in this communication—a fact too often forgotten in the haste toward implementation. Every affected manager needs to champion the change. 6. Perform according to plan. During this phase, people must work to achieve the objectives of the plan. Make sure learning loops are in place so that people can track whether the plan results in the desired effects. If the envisioned outcome is additional sales, are sales increasing? If the envisioned outcome is cost savings, make sure people are able to track those savings. 7. Assess the results, then reassess your position. During this final phase, you need to assess results. You should track both the desired outcomes and also the unseen and unintended consequences. For example, when one of our clients re-engineered its sales process, it was envisioned that it would reduce overall costs to the company. But a follow-up analysis showed that the costs had not gone away—they’d only been shifted to other departments. The management team spent considerable time analyzing exactly which savings were real—and which were a mirage. That’s the change process in a nutshell. Let’s look at some of the key factors of success. Key to effective change is assembling an influential and effective planning group that represents a broad cross section of interests. I already talked about power sources and stakeholders. Don’t make the group too large. Ten to thirteen people is ideal. More than that, and it’s difficult to have everyone feel engaged and taking part in the conversation. A mixture of viewpoints—People who are deeply familiar with the issue should be combined with people who have less of a stake in the solution. Skill in group process—Choose people who have shown they can take the time to listen and understand other people’s views, as well as be thoughtful advocates of their own position. Mixture of communication styles—Choose people who are analytical along with people who are more intuitive. Choose a few assertive voices, but balance them with people who are more inquisitive. You can use our free Straight Talk survey to discover your communication style, create a Team Profile, and compare styles to receive tips to improve communications. Once the team is in place, members need to decide on their rules of engagement and make sure they fully understand the overall decision-making process—and their role in it—before they begin actual work. As I discuss in Chapter 4 of my new book, it’s critical the planning team’s decision-making responsibilities are clear. Otherwise, you’ll wind up with a change process no one understands and is cumbersome to track and manage. Is the team’s role to develop detailed proposals to present to senior management for approval? Does the team have to reach consensus? Does it have the final say? Who will make the ultimate call? The board of directors? The CEO? Some other manager or management team? Make sure decision-making roles are clear. Real change takes time. It requires time for people to analyze and decide on the organization’s priorities. People need to process complex data and develop different scenarios. They need to build agreement for a particular set of actions. The investment in time will be returned tenfold in the durability of the commitments and attention to results you get down the road. An obvious reason to hire a skilled facilitator is to make sure the discussion stays on track and that everyone’s ideas are heard. Members of the planning group should carefully weigh the merits of choosing one of the group’s members to facilitate. The facilitator needs to be neutral, and needs to be unhampered by fears of losing his or her job. An outside facilitator can bring neutrality and a wealth of experience to the process. This creates a positive climate of trust in which people feel free to express their viewpoints. A skilled facilitator can also help make sure you design an effective change process. Much as a ship’s navigator helps chart the course, a skilled facilitator should be able to help you achieve the right balance of engagement and speed. The facilitator should be able to orient the group at all times—and put each step in the journey into context. A skilled facilitator should also help you capture the most important ideas and organize them. Ultimately, he or she should be able to help you draft documents, such as a strategic plan or action plan. Most people and organizations can only absorb one or two large change initiatives at one time. When managing a change process, focus on one, two, or three priorities. Leave the rest for later. The best way to identify priorities is to first do a light analysis to see whether a particular goal or priority rises to the top. If the light analysis doesn’t reveal the best option, do a deeper analysis. The planning group should ask: What are the costs and benefits of implementing each option we’re considering? What will have the greatest impact on our customers and our long-term success at the least cost? You don’t need a detailed cost-benefit analysis; you need a reasonable estimate—enough to be able to see which option has the greatest merit. The ongoing support and championship of the leaders in the organization is crucial to any change process. If the planning group encounters resistance, then the top leader’s authority needs to be invoked. What if the champions start to wilt at this moment? Then the planning group should either wait until new champions appear—or disband. Championship from the top is essential if change is going to be real and meaningful. If the champions have vanished, there’s no point in proceeding. LRI’s expert consultants can guide you through practices and processes that will result in effective process improvement. Please call us for a free consultation at (800) 598-7662 or email us.